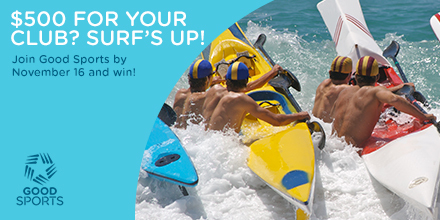 Join Good Sports this summer and win cash for your club! Good Sports is helping local sporting clubs enjoy their summer. For a limited time, all clubs that join the free program will go in the running to win $500 cash for their club. Running a community sporting club is hard work and it can be difficult to find time to focus on what makes your club great – the feeling of being part of being part of something bigger. The Good Sports team supports clubs to get on with enjoying their summer, providing the free tools, resources and supports clubs need to create the best sporting experience for their members and guests. It takes out the guesswork, giving volunteers peace of mind and making clubs more appealing places for communities to come together. Community sport is special. It empowers people and inspires others. The right club can become like a second family. Good Sports supports local clubs to be their best, recognising the important role local clubs play in Australian communities. It’s all about providing healthy, positive and nurturing environments for members and guests to enjoy. The result? Stronger clubs who are leaders and role-models in their communities. Clubs like Melville Cricket Club, part of the program since 2015. For Melville, joining Good Sports was a no-brainer. “We joined Good Sports because we wanted to ensure our club environment was welcoming, inclusive and provided good role-modelling for our players,” explains Club President Roger Wiley. Research shows that Australians are caring more about their health and wellbeing. Show them their club does too and join Good Sports for peace of mind knowing your club is backed by Australia’s largest health initiative in community sport. With $500 up for grabs, there’s no better time to join the team. With over two decades of experience, Good Sports knows what works when it comes to promoting healthy behaviours and reducing the impact of alcohol and other drugs. Nearly 9,000 clubs are proud to be part of the program. Join now for free access to policies, tools and resources around alcohol management, tobacco, illegal drugs, safe transport, junior role-modelling and in some states healthy eating and mental health. To be eligible to win the Summer of Good Sports competition, your club needs to register to join Good Sports before 16 November and achieve accreditation before 15 December.